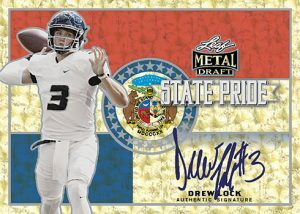 2019 Leaf Metal Draft - Football Card Checklist	Overall rating:	3	out of 5 based on 1	reviews. 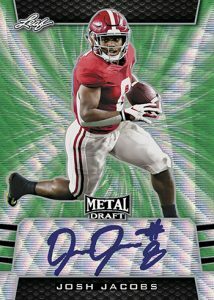 2019 Leaf Metal Draft Football is the annual release aimed at adding a chromium finish to upcoming NFL draft picks. The release only offers autographs and has a small but well managed checklist. This years release sees the addition of a Hobby Jumbo format box that offers 9 autographs and 1 slabbed pre-production autographed proof card, which is exclusive to the format. 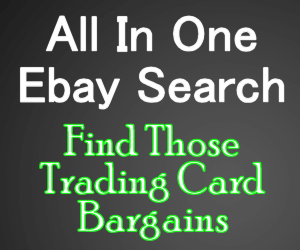 Regular hobby boxes offer 5 autographs each. 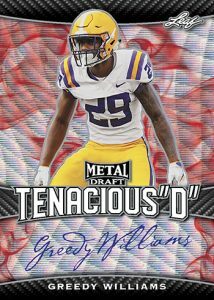 Releases such as this, and the previously released Leaf Draft Football, offer a great chance for collectors to grab early career autos of future stars.